I love a good draped mini skirt. They're comfortable and flatter all types of body shapes. It's versatile to wear as casual or dressy. This simple tutorial will show you how to make this all from about 1 yard of fabric. I used this hatchi metallic knit here from Fabric.com. It has a 4 way stretch and the perfect festive knit for NYE. Pair with a blazer, sweater, or even a tshirt and it looks great. Get a piece of fabric that measures your widest portion of your hip/bottom area plus 9 inches. For ex) a 36 inch widest part would be 45 inches. Length x 2 + 1 inch. So if you want the skirt 18 inches it will need to be 37 inches in length. Take the fabric fold in half and pull it over to the side as far as you can go keeping the top edges together like the photo. Cut the sides to make them even. This is why we added the 8 inches since you will cut part of the sides off. Flip it right sides together and sew the top along the edge. Flip fabric out so the right side is up now. Use elastic that measures your waist plus 1 inch. You will create a casing for it by top stitching the proper width along the top. Use a safety pin to guide the elastic through. 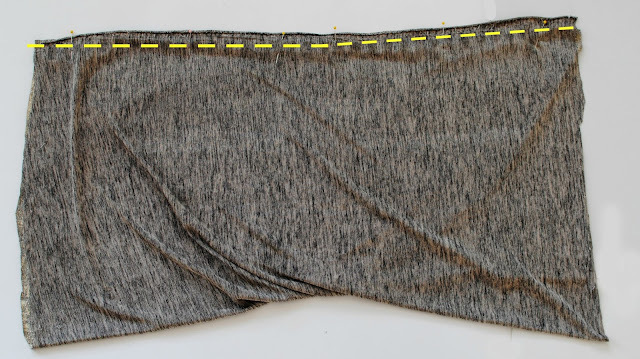 Sew elastic ends into place by zig zagging over them a couple times. Place "tube" right sides together and sew all 4 layers together. You are a very original person once thought up such an amazing outfit. Thank you for sharing with readers, especially creative ones like me. I know that you have to try hard to succeed, but you seem to be born with such a talent. My best friend is designer. And I will write friendship essay using advices from https://nerdymates.com/blog/friendship-essay about us soon. I hope it will be easy with these advices.